It was in the late 1960’s that Art took the 5 best singers from his choir at the St. Vestal C.M.E. 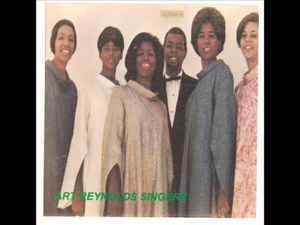 church and created the gospel singing group, the “Art Reynolds Singers”. As the first gospel group to record for Capital Records, they soon became pioneers in the development of “gospel rock”. Many considered their music too secular for the time. Their first album “Tellin’ It Like It Is”, went on to become one of the biggest selling albums for a new gospel group. It received local and national acclaim. “Jesus Is Just Alright” was the first song recorded by other groups from the “Tellin’ It Like It Is” album. The song was recorded and made famous by the Byrds, the Doobie Brothers and DC Talk. Four other albums followed: “Long Dusty Road”, “The Soul-Gospel Sounds of the Art Reynolds Singers” and “It’s a Wonderful World”. Art later changed the name of the group to the Art-Forms Ltd. and produced 2 singles for RCA records, "I'm a Bad Man" and "Time to Call It A Day". Wolfman Jack described Art's vocal on "I'm a Bad Man", as the birth of a new Isaac Hayes."